Dear Readers, Welcome to speedyfuture.com, As you all know that we Upload some Important Study Material regularly. 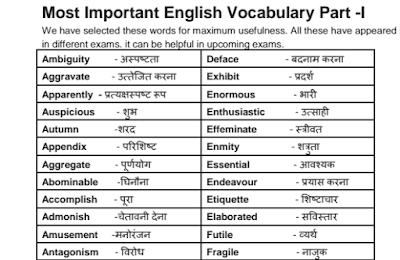 So just like that, In this post, we are sharing Most Important English Vocabulary with Hindi Meaning in pdf. This PDF is prepared as a helping hand to all students preparing for competitive exams. You can easily download this PDF from the download button given below. 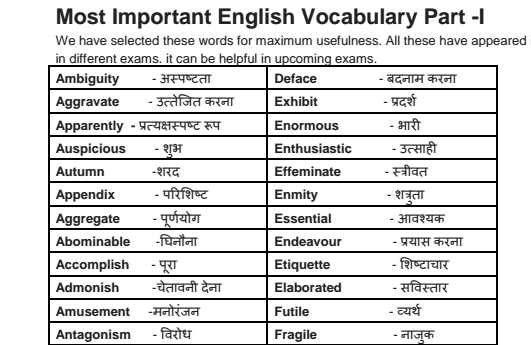 So, friends, I hope you like this post of Most Important English Vocabulary with Hindi Meaning in pdf. I hope these notes will be useful to you. And will be used in preparation. If you like this post, share it on Facebook and Whatsapp with your friends.